By installing skylights—large windows and apertures in your roof—you can naturally warm up your home, brighten and open up your interiors, and possibly even save a little on heating and electricity bills. Skylights have been used in architecture since ancient Rome. In fact, one of the most famous cases is probably the Oculus in the Pantheon, which draws in sunlight to flood the temple in a glorious, otherworldly glow. 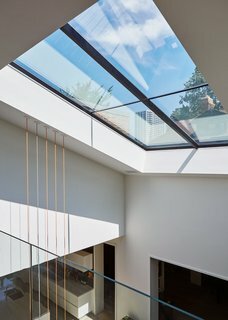 As energy efficiency becomes an even more important issue to modern architects, more homes are being cleverly designed with skylights. 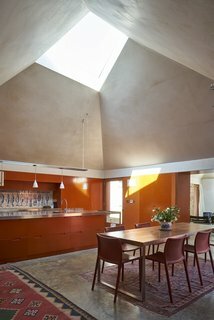 Such strategically-positioned openings in the roof not only introduce natural illumination and warmth, but they also lend a loftier feel and help create a connection between indoor spaces and the sky above. This beach house vacation rental in Cornwall designed by London architect Alex Michaelis has multiple skylights, including a double-height slot next to a winding staircase that brings in sunlight during the day and frames the starlit sky at night. 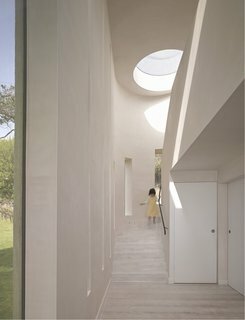 In the home of Israeli architect Pitsou Kedem is an elongated skylight that runs along the entire length of a stairwell, flooding the interiors with sunshine. 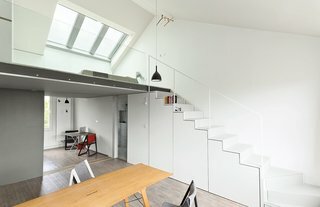 This compact London apartment designed by joiner Roger Hynam and architects Silvia Ullmayer and Allan Sylvester has a fully retractable mechanical skylight that opens and closes automatically when its sensors detect rain or excessive wind. The six interconnected pyramidal pavilions of Red Tin House by London practice Henning Stummel Architects have high ceilings and generous skylights. 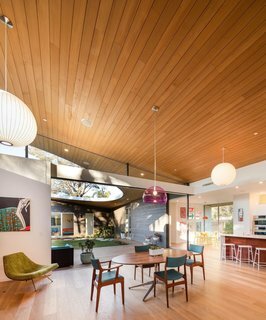 The low contour of the roof maximizes the spatial volume of the house and the natural light that floods in through the wide skylights. dSPACE Studio transformed a 1970s-style Chicago residence into a bright, open, and stylish home with an expansive 20-foot skylight that presents views of the surrounding neighborhood. 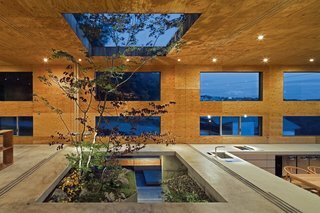 Blurring the boundaries between indoors and outdoors, this 1,300-square-foot home on the island of Honshu, Japan, by architect Keisuke Maeda has multiple windows and skylights surrounding its concrete base. 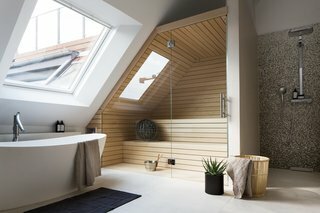 This converted attic in a turn-of-the-century building in Berlin’s Charlottenburg neighborhood has a large skylight on the side-slope of the roof, which allows one to look up at the sky while having a relaxing soak. 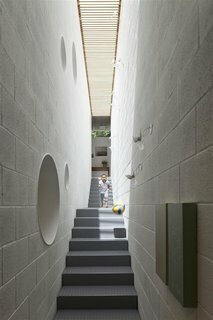 Australian practice PandA Studio Architecture designed House Nakamaruku in Kanagawa, Japan, with skylights on the upper level that bring in plenty of natural light without compromising privacy. 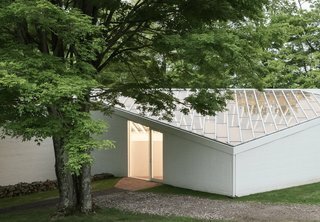 The Sculpture Gallery in architect Philip Johnson’s Glass House Estate in New Canaan, Connecticut, is a skylighted space with an almost entirely glass roof that showcases his art collection. A large glassless opening on the sloping curved shed roof of this Californian home opens the courtyard to the sky and the elements, while giving the surrounding living areas an almost outdoor, park-like feel.